I drive a Rolls Royce/'Cos it's good for my back. “”He's basically an orange traffic cone at this point. John Boehner, aka "The Orange Overlord" and the "Weeper of the House", was the tangerine-hued jackhole who led the Republican-held House of Representatives throughout the majority of Obama's second term. He represented the 8th District of Ohio, an area encompassing mostly rural counties in the westernmost part of the state, close enough to be demographically indistinguishable from Indiana. He enjoys "nice conversations" and has demonstrated multiple times how relentlessly stupid he is. Between mixing up the US Constitution with the Declaration of Independence and thinking that Gitmo detainees are more comfortable than "many Americans," no other party in the world (besides UKIP and the regimes of several theocracies) would allow him to be on a stage, let alone be a leader. He joined the US Navy after graduating from high school in 1968, but was discharged a few weeks later because he has a "bad back". Currently, one of his favorite leisure activities is playing golf. Hmm. His extensive military career proved to be excellent preparation for his political role as a chickenhawk war hawk, though. In 1995, he doled out checks from tobacco lobbyists on the floor of the House before a vote on tobacco subsidies. He then issued a "lol whoops sorry" apology and prattled about the importance of ethics reform in keeping people (like him) from doing things like this. Sitting on information regarding the Mark Foley scandal. Backing Rich Iott, the Nazi reenactment guy, for Representative in the 2010 elections. Getting defeated… on a light bulb bill. Just in case the last mistakes were just uninformed errors, Boehner has had serious issues dealing with the ultraconservative faction of the Republican Party. 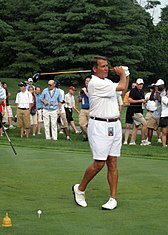 In the fiscal cliff debacle, Boehner was unable to rein in the Kochsuckers for yea votes on Plan B (which would have resulted in a modest tax hike for a very, very small portion of rich Americans). Furthermore, a handful of far-right Republicans attempted a coup in which another member (or even outsider) would be voted Speaker. Boehner kept his job, which may not have been such a bad thing considering some of the alternatives. In due time, Boehner opted to resign and wrap up his career on his own terms. He left in October 2015, flushed for not being enough of an obstructionist far-right loon. He was replaced by Paul Ryan, who himself resigned in January of 2019, just in time to see the Democrats regain control of the House. This entire process shows how the modern GOP is being eaten alive by the Tea Party nuts, so don't drink that tall, cool glass of schadenfreude just yet. Currently, Nancy Pelosi is occupying the most thankless job in politics. He has also said that the Obama Administration is "snuffing out the America that I grew up in." Considering that he was born in 1949, this would seem to imply that he is nostalgic for — among other things — black-and-white television, black-and-white morality, Jim Crow laws, the Cold War, Dwight D. Eisenhower, McCarthyism, the Korean War and the first years of the Vietnam War, war protests and the Kent State shootings, the Sherman Antitrust Act, the lingering effects of New Deal programs, strong labor unions and a strong American manufacturing base, the Glass–Steagall Act and other tight regulations of Wall Street, demand side economics and a top marginal tax rate of 75% or more, and Democratic Party control of both houses of Congress for most of the first 30 years of his life. In 2016, Boehner entered a revolving door and joined the board of directors of Reynolds American tobacco company: doling out those checks on the House floor sure paid off! In 2018, Boehner joined the board of directors of Acreage Holdings, one of the largest cannabis corporations: will Attorney General Jeff Sessions try to put him in prison? Alas, Jeff Sessions was sacked before this promoter of The Weed with Its Roots in Hell could face proper justice. ↑ GQ, "The 25 Least Influential People of 2013"
↑ Boehner tone trolling Obama after failing to prevent the crazies in his party drive the US economy towards default. ↑ "The Crying Shame of John Boehner", a none-too-flattering portrait of the Weeper by Matt Taibbi. ↑ Conservatives hate efficiency, apparently. ↑ Heavy smoker John Boehner joins tobacco company's board by Matt Egan (September 15, 2016: 3:23 PM ET) CNN. ↑ Boehner joins cannabis company board to push for medical use by Morgan Gstalter (04/11/18 09:14 AM EDT) The Hill. This page was last modified on 22 February 2019, at 07:53.